Just a few years after he took over his family’s business operating gas stations — and not long after graduating from law school at Duke — Carl Bolch Jr. made what some called a crazy decision: to offer self-serve gasoline at the pump. “People said I would lose money, that customers would just drive off after pumping gas,” he recalls. At the time, just a few companies were offering self-service, and most were in the West and Southwest. For many Southern states, self-service gasoline was unheard of and, in some cases, barred by law. But Bolch pressed on, making his gas stations the first in Alabama, Georgia, and Florida to offer self-service and working to change laws where needed. “We not only didn’t lose money, it was the best business decision I ever made,” he says. 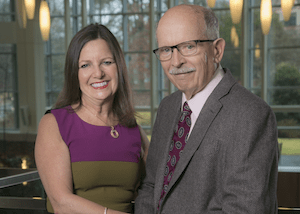 Susan Bass Bolch and Carl Bolch Jr., photographed at Duke Law School (Duke Photography, 2018). People didn’t drive off. They pumped their gas and came inside to pay. And then they started buying other items while inside. Today RaceTrac Petroleum Inc. is a $9-billion family business operating more than 750 stores in 12 Southern states. And self-serve gasoline is the standard in all but two states in the U.S.
Why did self-service work? Why didn’t people just drive off? For Bolch, the answer is obvious. “It comes down to the rule of law,” he says — a system of laws and understood repercussions for breaking those laws that frames our business and personal interactions and creates a moral code of behavior that the vast majority of us not only observe but cherish. Bolch, who earned a B.S. from the Wharton School of Business and took over his father’s small gas station business shortly after graduating from Duke Law School in 1967, sees his success as the direct result of the strength of the rule of law in the United States. That view has been reinforced by international travel — a passion he shares with his wife, Susan Bass Bolch, a lawyer and former RaceTrac general counsel who now sits on the company’s board of directors. “Our interest in the rule of law and what it does domestically and globally stems from our curiosity in our travels,” he says. “We make two trips around the world each year. The people themselves don’t seem to change that much, but their prosperity, their society, their situations change drastically depending on the strength of the legal framework. Establishing a multidisciplinary institute devoted to protecting and advancing the rule of law worldwide is, for the Bolches, a way to both strengthen the system that has provided them with so much opportunity and extend that opportunity to the far corners of the planet where a framework of laws and justice could undergird and foster societal transformation. The Bolches believe that defending the rule of law begins with a strong and independent judiciary, which is one reason why the institute that bears their name will focus on the study of judges and judicial institutions, judicial training and education, and law reforms that strengthen and advance the administration of justice.